Opening Song: "Shake Your Sillies Out" by Raffi. The kids really know it now! 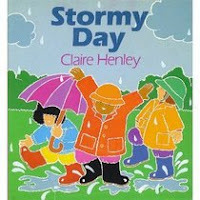 Memory Box Item: This week's Memory Box item was a mushroom from the book Stormy Day. Rhyme: The Itsy Bitsy Spider. We have a purchased felt set for this rhyme and we do it first with the itsy bitsy spider and then we do it in a deep voice with a BIG, FAT spider and then in a high voice for the eensy weensy spider. Book: Duckie's Rainbow by Frances Barry. One of the kids said, "We read this one before!" because we had read Duckie's Ducklings last week. They enjoyed the other Duckie book, so I wanted to share this one with them, too! They loved naming the colors on each page. Felt Activity: Weather felt pieces. You have noticed by now that this is an activity we repeat a lot. This week I improvised a little story as we decided to see what kind of weather we were having in storytime. First the sun was bright and shining, then we saw a bolt of lightning. As the wind picked up, we developed a tornado! And then the wind died down and we had a little more rain. And then we ended with a beautiful rainbow! The nice thing about this activity is that even very young children can do it, so it gives our younger siblings something to do. Book: The Big Storm: A Very Soggy Counting Book by Nancy Tafuri. As the weather starts to get bad, different forest animals duck into a cave to wait out the storm. But what they don't realize is that there are two bears sleeping in the cave! I read the book, but this would transfer very well into a felt story. Five umbrellas stood by the door. Riley took the pink one, and then there were four! Four umbrellas, pretty as can be. Ben took the blue one, and then there were three! Three umbrellas with nothing to do. Ollie took the green one, and then there were two! Lincoln took the yellow one, and then there was one! One umbrella alone in the hall. Ashly took the purple one and that was all! Take-Home Craft: Weather hangers! We ran off the large cloud and small weather pictures on cardstock and put those in the bag. We punched the holes in the clouds, but we didn't them out or color them - they can do that at home. We included the yarn and our weekly handouts with a book list and activities they can do at home! Next week's our last week in our spring storytime series. We do our registered preschool storytimes in the spring and in the fall. Over the summer we'll have drop-in family storytime.